The jawbone grows to approximately its adult size by your late teens. Unfortunately, that size is often too small to hold developing wisdom teeth. When there is not enough room for your wisdom teeth, they may become impacted, or partially trapped in the jawbone and gums. 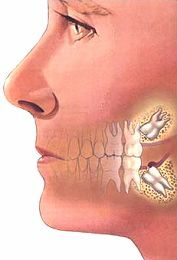 The crown, or top of the tooth, may erupt, or just break through the gum, or it may remain completely within the bone. The roots can grow in unusual directions and may cause a variety of problems in your mouth and with your sinus cavity or the nerve in your lower jaw. Since it is not practical for most people to evaluate how their wisdom teeth are developing, the best approach is to visit an oral surgeon such as Dr. Rowan for an evaluation. He will review your dental history, take dental X-rays, and perform an examination to determine the general health of your mouth and the condition of your wisdom teeth. If a problem with your wisdom teeth is detected, he may recommend surgery to remove them in order to avoid future problems. Early removal (usually mid teens)is best for most patients, as it usually helps to avoid more serious problems later on. How and where your wisdom teeth are removed depends on several factors, including whether your wisdom teeth are erupted or impacted and how deep the roots are. Surgery may often be done in the oral surgeon's office rather than in a surgical center or hospital. Your oral surgeon will review the recommended procedure with you so that you will fully understand and be comfortable with the procedure before it is done. You will also be given information about eating, medication, rest, driving, and other considerations before surgery. After surgery, you will rest while under close observation as you recover from the anesthetics used. You normally will be able to go home once your doctor is satisfied with your recovery. The healing process begins immediately after surgery as your body sends blood to nourish the tooth socket. Simple pressure from gauze is usually all that is needed to control the bleeding and to help a blood clot to form in the socket, which promotes healing. Eventually, the bone surrounding the socket begins to grow, eventually filling in the socket completely. As your mouth heals, you can promote faster healing and avoid complications by simply following the instructions that your oral surgeon and his staff will give you. While you may experience some discomfort as your mouth heals, following simple instructions will normally be all that is needed. Usually, a follow up appointment is not needed. Tooth Crowding: It has been theorized that impacted wisdom teeth can put pressure on other teeth and cause them to become misaligned (crowded or twisted). This theory isn’t universally accepted by all dental professionals. As with any dental procedure, your dentist will want to initially conduct a thorough examination of the wisdom and surrounding teeth. Panoramic or digital x-rays will be taken in order for your oral surgeon to evaluate the position of the wisdom teeth and determine if a current problem exists, or the likelihood of any potential future problems. The x-rays can also expose additional risk factors, such as deterioration or decay of nearby teeth. Early evaluation and treatment (typically in the mid-teen years) is recommended in order to identify potential problems and to improve the results for patients requiring wisdom teeth extractions. Only after a thorough examination can your oral surgeon provide you with the best options for your particular case. Wisdom teeth removal is a common procedure, generally performed under local anesthesia, intravenous (IV) sedation, or general anesthesia by a specially trained oral surgeon in an office surgery suite. A combination of the above is often used. The surgery does not require an overnight stay, and you will be released with post-operative instructions and prescriptions, to help manage any swelling or discomfort.